While Richard continues to train horses from a myriad of equine disciplines, his passion and focus is with the Reined Cow Horses. 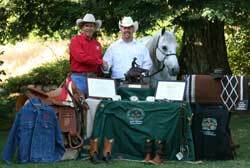 His training program consists of preparing horses for the Snaffle Bit Futurity, continued development, and showing in the Hackamore and Bridle Horse classes. ​More and more, non-pro enthusiasts are finding Richard's teaching methods an invaluable resource as they pursue their own Reined Cow Horse goals. Richard is happy to visit with you about your horse and how you might achieve your goals while enjoying the journey. Richard keeps a limited number of horses per month in training. ou are welcome to contact us for further information about Richard's horse training program.
" I came to Richard a very frustrated rider. After my first year, with Richard's training and patience, I qualified for the "Top 10 NRCHA World Show" in 2007. After only my second year of showing, I'm ending the season with a saddle, four buckles and both Regional Champion and Reserve World Champion Titles. What a year! Thanks Richard."